Champagne New Year (Stroke-by-stroke video) a video by randubnick on Flickr. This morning I had an idea for a little animation, and caught myself thinking about how to do it all day long. So tonight I got out my iPad and tried it. I made a drawing with the Brushes app, which captures a "stroke-by-stroke" video as you draw. As usual, there were problems and hiccups with the video as it was downloaded, so I did a little post-production editing in iMovie, and added the still image of the finished drawing. Rising Sun Through Window Screen (Digital Woodcut), a photo by randubnick on Flickr. 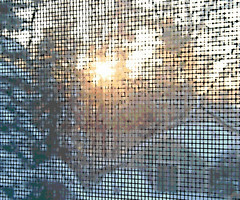 I was looking through some of the images I have used in the past, and came across some photos that I took in 2008, pictures of the winter sunrise, seen through a screened window. I had already used the photo to create a posterized version, posted here December 23, 2008. But I thought it would be interesting to see what the image looked like as a digital woodcut. So tonight I opened the original photo in Painter, posterized it, cropped it, and adjusted the brightness. Then I applied the woodcut effect, adjusting the number of colors until I got enough yellow. I liked the way the woodcut effect emphasized the lines of the screen. So then I moved the image back into iPhoto where I straightened it and cropped it one more time to get this image. Necklace with Jade and Red Wooden Beads, a photo by randubnick on Flickr. I finally finished this necklace tonight. I have been working on it over the past few days; tonight was the third try stringing it, and I finally got the proportions right and the knots in the right places. 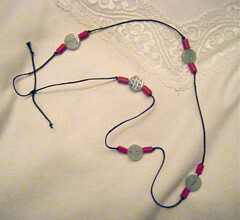 The beads are carved Chinese jade and red wood, strung on a cotton cord. Across the Water (Digital Woodcut), a photo by randubnick on Flickr. This image began with a photo that I took last week at one of Beverly's beach-front parks. I liked the way this scene looked in the late afternoon, so I took some pictures. Tonight I used Painter's woodcut effect to transform the original image, along with some color overlays and posterizing to change the appearance of the houses just a pit. 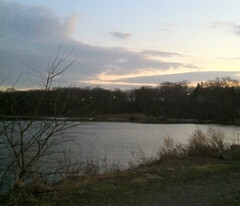 Then I used iPhoto to adjust the color to emphasize the December light. 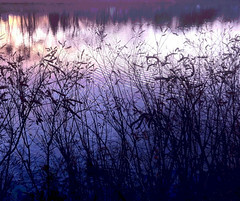 Silhouette Grasses and Pond (Digital Woodcut), a photo by randubnick on Flickr. 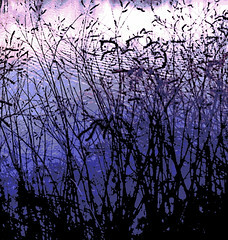 A few days ago (December 23), I published a posterized photo of grasses at the pond, from a picture I had taken at the Cummings Center Pond in early December. I also created a digital woodcut of the image in Painter, and here it is. Tonight I cropped it to show a closer view and to emphasize the silhouettes of the grasses against the water. 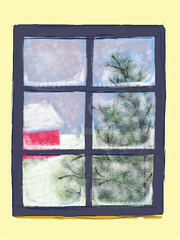 Snow Through the Window (Digital Drawing), a photo by randubnick on Flickr. Last night I posted an animation of a snowstorm seen through a window, a stroke-by-stroke video captured by the Brushes app as I drew on my iPad. Tonight I am posting the drawing as it looked when I was finished. Snow Through the Window a video by randubnick on Flickr. I had an idea for a little animation of a snowstorm, so today I got out my iPad and did a little drawing in Brushes. As you draw, Brushes captures a "stroke-by-stroke" video, and that is how I was able to make it snow. I am going to use this as a little electronic holiday greeting. Grasses at the Pond (Digitally Modified and Posterized Photo), a photo by randubnick on Flickr. Yesterday I found some photos that were still on my iPhone camera, pictures of grasses against the backdrop of a pond. (These were photos that I took on December 5, during a late afternoon walk at the Cummings Center.) Yesterday's image of beach grasses made me think about these photos, and tonight I decided to do something with them. I took the best of the photos and cropped it a bit. I liked the composition, but there were a few dead leaves in the water that were a little distracting, especially since I wanted the composition to emphasize that deep blue. So I opened the image in Painter and did a little clean-up with digital pastel. Then I posterized the image, and cropped again to get this image. 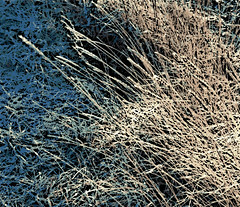 Beach Grasses in December (Digital Woodcut), a photo by randubnick on Flickr. It was warm today, fifty degrees! This is unusual weather in December, here north of Boston. We couldn't pass up a chance to take a walk at the beach so we went to a little beach-front park. There is always a lot to see, but today I was struck by the winter light on the beach grasses. I took lots of pictures. I edited them tonight, and although this looks like a simple image, it was fairly difficult to get. I did a lot of cropping and discarding until I arrived at this composition. Then I used Painter to do a little bit of clean up, and then applied the "woodcut" effect to emphasize the texture of the grasses. Light the Candles (Digital Drawing), a photo by randubnick on Flickr. Light the Candles (Stroke-by-Stroke Brushes Video) a video by randubnick on Flickr. Just press play and watch the candles light up! 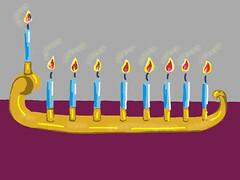 Last night I used the Brushes app on my iPad to draw this little menorah. Brushes captures a stroke-by-stroke video while you draw, so I used that feature to create this little animation. Happy Hanukkah! Four-Thirty Sky, a photo by randubnick on Flickr. This is a photograph that I took late this afternoon (4:39 PM to be exact). We stopped off at Starbucks to get a hot chocolate. There are only two Starbucks here in Beverly, MA, and this one is right on the Bass River. Right behind the drive-thru, there's a tiny park and a little river-side path, great for a little walk with the dog. As I pulled into the parking space, I noticed the colors of the sky, subtle but beautiful, so I took a few pictures with my iPhone camera. Tonight I edited the best of them in iPhoto and cropped it to get this composition. Intersections of Color, a photo by randubnick on Flickr. Tonight I did this little drawing exercise using the Brushes app on my iPhone. I was waiting around for something, so I decide to pass the time by drawing. I started by just drawing four simple lines in dark blue. Then I discovered "layers" accidentally by hitting the wrong button, so I decided to create a light blue layer for the background. Then I started filling in the areas created by the intersecting lines. I used two different brushes with different textures and sizes, and three different colors. Once I transferred the image into my computer, I used iPhoto to crop it to get this composition. Necklace with Green Shells and Beads, a photo by randubnick on Flickr. This is the necklace I made tonight. I had two kinds of beads in jewel-tone green, so I put them together, and I liked the contrasting shapes: disks made of shell and cubes made of glass. I strung them on a knotted cotton cord. I tied a knot on either sides of each bead, leaving just a little bit of room to allow the beads to move, especially the shell disks. Tree and Fence in Snowstorm (Digital Woodcut), a photo by randubnick on Flickr. 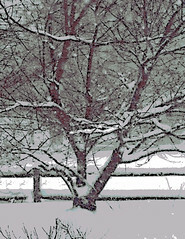 Yesterday I modified my photo of a tree in a snowstorm (taken in 2006); I used Painter to simplify the foreground with a combination of cut-and-paste and digital pastel. I also used Painter to create another version of the image, the digital woodcut that you see here. 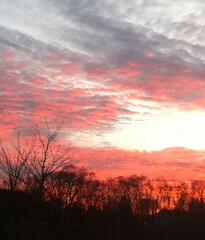 As an afterthought, I adjusted the color (in iPhoto), moving it a bit toward red. Tree and Fence in Snowstorm (Posterized Photograph), a photo by randubnick on Flickr. The weather outside is definitely not frightful; in fact, it is rather warm for mid-December. But I have been looking through some photos that I took a few years ago and found one that I took on February 12, 2006 of a tree in my yard during a big snowstorm. Today I wondered why I had never used that photo. The tree looked great in the snow! But I guess it must have been the foreground which was cluttered with grasses or perhaps the wayward branch that obscured the line of the fence. Tonight I decided to see what I could do about those problems. I copied the image and opened in Painter. I increased the resolution, and then got to work. I used a combination of cut and paste and digital pastel to simplify the foreground and eliminated the branch to get a clearer view of the fence. Then I posterized it, using trial and error to get the best color scheme, and this is the result. I also went on to create a digital woodcut, which I plan to post here tomorrow. 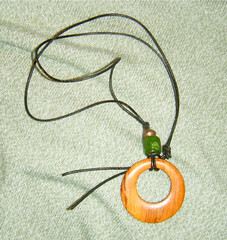 Pendant with Wood, Copper, and Green Glass, a photo by randubnick on Flickr. I made this pendant tonight. After a stressful day, I was looking for an easy project, something relaxing. But making something simple is not always as easy as it looks. Tonight it took a good amount of trial and error to get a good combination of shapes, textures, and colors. (When I make jewelry, I find myself thinking about what I learned in sculpture class, all those years ago.) 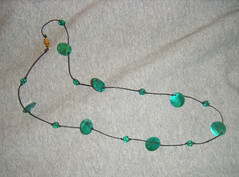 When I finished, I used my digital camera to photograph the necklace. Colorado Color Field (Posterized), a photo by randubnick on Flickr. 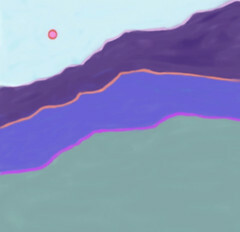 Last night I posted a sketch of the Colorado mountains drawn with digital pastel, done in the style of color field painting: very flat color, with lots of color contrast. I also created a second version of the image, this time with some texture and color variation added through posterizing. I also added the pink clouds and put dark green in the foreground. Colorado Color Field, a photo by randubnick on Flickr. This is a digital sketch that I drew tonight using Painter's digital pastel. I was drawing from imagination, inspired by memories of the mountains of Colorado, my home state. I started with layered silhouettes of mountains, and worked with colors that make me think of Colorado. I kept the colors fairly flat, and didn't use modeling. Then I decided to outline the mountain shapes, just a little at first. I found myself remembering doing color field painting in my college art classes in Pueblo, and then later at the University of Colorado at Boulder. (Color field painting is very flat with lots of play with color theory.) I still admire color field painting, and learned a lot from Professor Daigle, who taught me to do it, but I used to paint big canvases on the floor, on my hands and knees. 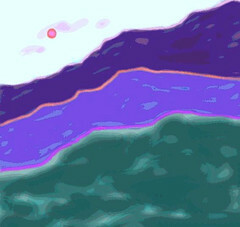 These days, if I am going to do color field paintings at all, it is going to be on the computer! As I thought about all this, I decided to call this image "Colorado Color Field" and that made me smile again. I also created a posterized version of this image, which I plan to post tomorrow. New Hampshire Sky (Posterized Photograph), a photo by randubnick on Flickr. Here's one more image from the drive up to New Hampshire last week. Although I had been taking pictures through the passenger side window, the sun was setting on the driver's side. It was hard to get a clear view, but I did my best, photographing around the driver, the dashboard, the transponder, and the Garmin. (I guess I could have moved the Garmin, as has been suggested, had I thought quickly enough.) Anyway, last night I cropped this image out of the background. Then I opened the image in Painter, and posterized it. 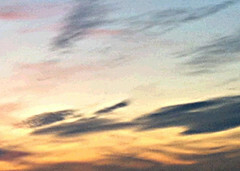 I did one final crop in iPhoto to get this composition. New Hampshire Sunset (Digitally Modified Photo), a photo by randubnick on Flickr. 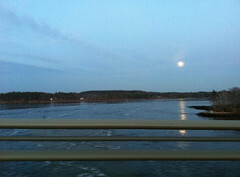 Yesterday I posted a photograph that I took during a recent drive up to New Hampshire, a view of the moon over the water. I took the picture through the car window on the passenger side. But the view through the driver's side window was even better, an intense sunset reflected in the water. I wanted to photograph it, but it was impossible to get a clear shot. The the view was obscured by the steering wheel, the transponder, and the Garmin on the dashboard. But I decided to try anyway, and took some pictures. 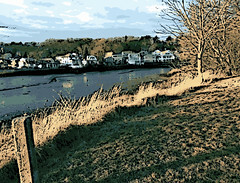 Tonight I opened the most promising of those photos in Painter. I did a basic crop to define an area in the background that I wanted. After I resized the image, I used cut-and-paste as well as digital pastel to obscure the Garmin, which was overlapping the shore line. Then I did a little bit of very light posterizing, and this is the result. I think it was worth the trouble because I would like to paint this scene, and this would make a good reference photo. Moon in New Hampshire, a photo by randubnick on Flickr. I took this photo during a ride up to Durham, New Hampshire. It's a beautiful drive with lots of bridges, sometimes with water on both sides. I like to be in the passenger seat so I can take pictures. I took this photo around 4:30 PM. The moon was already visible and I liked the way it looked reflected in the water. Later, once I got the image into my computer, I just straightened it a little bit with iPhoto, and cropped it just a little. But the colors are just as they came out of the camera. Double Swirl (Posterized), a photo by randubnick on Flickr. 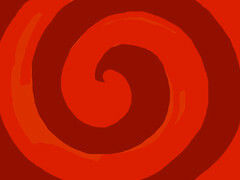 Last week, I made this geometric image on my iPad to use as an illustration for a recipe for barbecue sauce. It's pretty simple, but I think it would make a nice pattern. The recipe is simple too. Click here If you want to see the recipe, 'Ol' Pokerface Barbecue Sauce' on Seasonings for Every Palate. 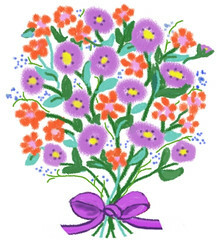 Very Quick Bouquet (Final Version), a photo by randubnick on Flickr. 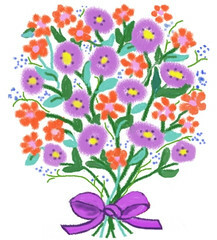 Last night I posted my digital drawing of a bouquet that I drew with digital pastel in Painter. Even though it was a very quick little drawing, I was very happy with it. This afternoon, I worked on it just a little bit more. I corrected a few mistakes, and made some minor changes to create a more balanced composition. Very Quick Bouquet, a photo by randubnick on Flickr. 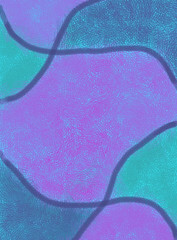 This is a digital drawing that I created tonight using Painter. I had intended to do try to figure out a technical problem with using layers. But I decided that what I really wanted to do was just relax and draw for fun, and so I did this little bouquet with digital pastel, working from my imagination. Lacy Branches (Digital Woodcut), a photo by randubnick on Flickr. 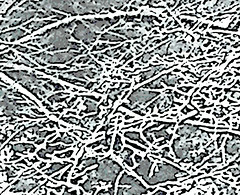 Well, even though the temperature was near sixty degrees today, tonight I have been spending time tonight working on this image of snow on branches. I have been thinking about images with a winter theme for the holidays, but we have only had the one snowstorm so far here in Boston. (NOTE: This is fine by me! I am not complaining!) So I poked around in last year's photos and found one I wanted to work on, a photo of snow-covered branches against a shadowy background. I took the original picture because I liked the lacy effect of the branches, but the image was too dark, dim, and didn't have enough contrast. So tonight I opened the image in Painter. I adjusted the lighting, contrast, and focus. Then I created a digital woodcut, fooling around with the controls until I had the amount of black I wanted to see. Then I did a little post-production on it, posterizing again and making the image brighter. Then I cropped it to get this composition. 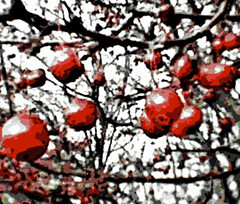 Winter Tree with Red Berries (Digital Woodcut), a photo by randubnick on Flickr. This image started with a photo that I took back in 2005, with a low-resolution cell-phone camera. (I posted it here on December 19, 2005.) People seem to like that little photo, and I have been thinking about using it for holiday cards. Tonight I found the old jpeg on my computer, and imported it into iPhoto. Then I opened it in Painter for editing. The image was very small, so I resized the canvas. Then I posterized the image and changed the resolution. After that, I adjusted the brightness and sharpened the focus. Then I started turning this into a "digital woodcut", experimenting until I had the colors I wanted to see and the right amount of black. Finally I cropped it just a bit to get the composition that you see here. Winter Sky at Sunset, a photo by randubnick on Flickr. 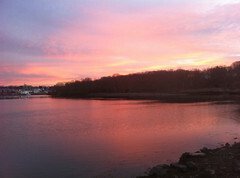 Yesterday I posted a photograph that I took last week, a picture of the sun setting over the Bass River here in Beverly, MA. There's a Starbucks near the river, and we had stopped to get coffee at the drive-thru and walk the dog on the little riverside path. It was late afternoon, around 4:30 PM, and while we were there, the sun started to set. The scene was beautiful, so I took a picture. The sky kept changing every few minutes, so I took some more pictures. This was one of the best. Tonight I cropped the original image to get this composition, but apart from that, this is the image just as it came out of the (iPhone) camera. 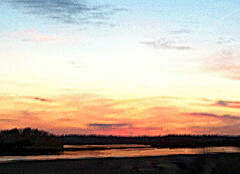 Sunset and River (Posterized), a photo by randubnick on Flickr. This is a photograph that I took last week. After running errands, we stopped at Starbucks near the Bass River, here in Beverly. (There's a nice little path behind Starbucks and it's a nice place to take a walk with the dog.) It was about 4:30 when we got there, but the sky began to change rapidly as the sun went down. The sky was amazing, so I took some pictures, and this is one of the best. Tonight I used Painter to do some selective posterizing of the commercial buildings in the background. I also lightened some of the shadows with iPhoto. I think it would be fun to try to paint this sometime. 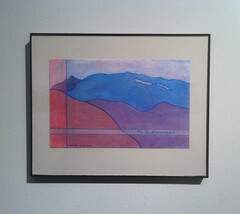 At Snowmass (Small Works Show, Porter Mill), a photo by randubnick on Flickr. Tonight I attended the preview party for the Small Works Show, a juried exhibit at Porter Mill Studio. One of my drawings, "To Snowmass," was accepted for the show, and it is very small, only 5 x 8 inches. This is one of the Colorado drawings I have been creating, basing them on a little sketchbook that I took along on a trip to Colorado in the 1980s. Last week, I learned that this piece had been accepted for the Small Works Show, so I framed it and turned it in. But I forgot to take a picture of it in its frame, so tonight, before I left the preview party, I used my iPhone camera to take a quick photo of my piece on the gallery wall.